Positive results have been obtained from randomised controlled single or multicentre trials in patients with advanced colorectal cancer including those with stage II/III diseases9, 17-20. 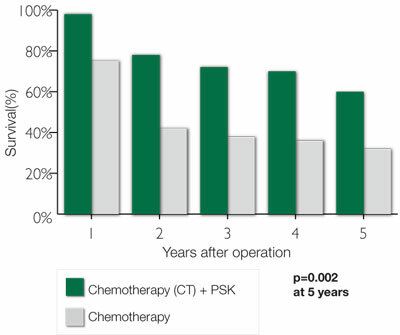 A summary of results from randomised controlled trials for both disease response and survival outcome in patients with colorectal or colon cancer receiving chemotherapy or radiation therapy with PSK is shown in (Table 1). 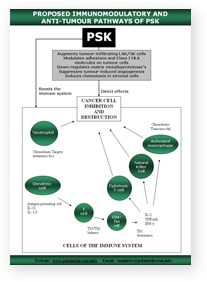 The results showed that PSK immunotherapy significantly improved overall survival and disease-free survival rates. For example, as shown by the survival curves (Figs. 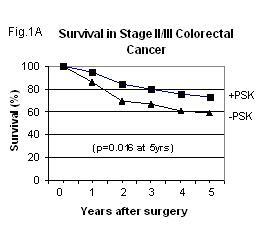 1A and 1B), patients with Stage II/III or Stage III colorectal cancer significantly benefited from PSK immunotherapy following surgery18. 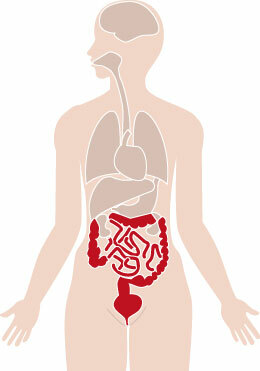 A meta-analysis has been performed to evaluate the combined data from three centrally randomised clinical trials for a comparison of the effect of adjuvant immunotherapy using PSK and chemotherapy (n=578) with that of chemotherapy alone (n=516) for 1,094 patients with curatively resected colorectal cancer21. All trials had a follow-up for 5-years after surgery and the end-points were overall survival and disease-free survival (Figs. 2A and 2B). The overall survival risk ratio was 0.71 (95% CI: 0.55-0.95, p <0.006) and the disease-free survival risk ratio was 0.72 (95% CI:58-0.90; p <0.003)21. 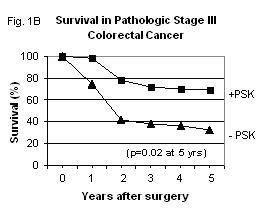 The results demonstrated that adjuvant immunotherapy with PSK is effective with respect to improved survival and disease-free survival of patients with curatively resected colorectal cancer.